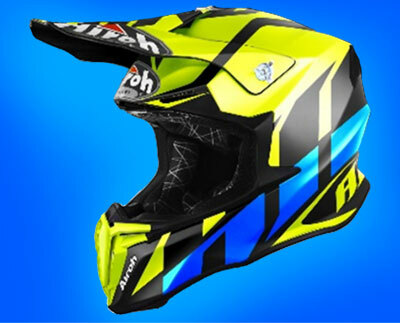 The Airoh motocross helmets have been developed to provide great performance and safety to riders. Below you will find the current range. 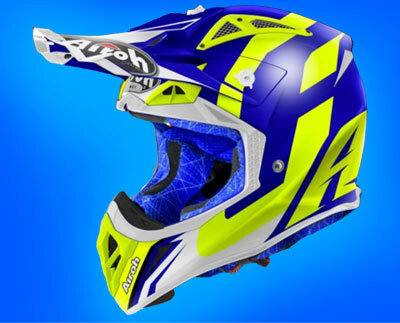 Airoh uses advanced technologies to improve the motocross helmet. By performing simulations on a computer, they can optimize the impact absorption with as little material as possible. This keeps the weight low and offers better protection. 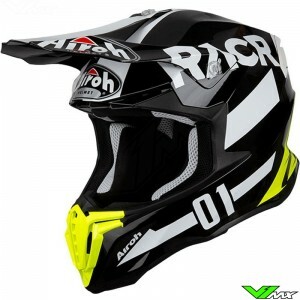 Due to the low weight and innovative materials, the Airoh motocross helmets have a very comfortable fit. With the know-how from the company, advanced ventilation systems are created which will enhance the performance of every rider. The soft inner pads and ergonomic shapes ensure a good fit. Safety is also a good characteristic of these Airoh helmets. With the help of proven impact absorption technologies, the helmets are optimized. The experience of Airoh ensures great quality and performance in terms of safety and comfort. The technical properties of the various Airoh motocross helmets are explained in more detail below. The Switch is the beginner model of the Italian brand. A competitively price motocross helmet with all the basic features to get on the track. The Airoh Switch has an excellent ventilation system. Multiple openings at the front and rear ensure the flow of air. This cools the rider and ensures better performance in warm weather. It weighs only 1270 grams (+/- 50g), which is very light compared to other helmets from this price category. The Twist is a very light motocross helmet designed for the most demanding riders. With a weight of only 1180 grams (+/- 50g), the Airoh Twist is among the lightest in its price category. This has been achieved by a light thermoplastic shell and optimized design by the experts in Italy. The engineers of Airoh have applied a modern and aggressive design to this helmet. To complete the off-road experience, it is packed with a lot of features for off-road riders, such as an adjustable peak and dust filter. The ventilation system consists of different openings at the chin, eyebrows and back. Finally, it has a removable and washable inner lining with an antibacterial treatment for better hygiene. The Airoh Aviator 2.3 is the top model of the Italian manufacturer. This is the helmet that is used by many professional motocross riders in the world championship. It is equipped with many advanced features. An ultra-light outer shell is made of carbon and Kevlar. 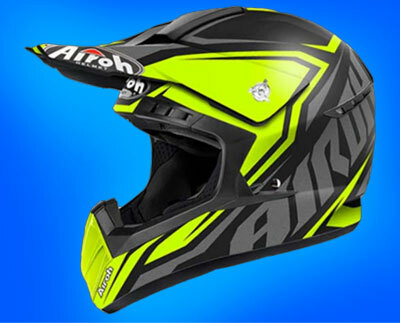 The Airoh Aviator is one of the lightest motocross helmets on the market at only 1070 grams (+/- 50g). The low weight promotes the comfort and performance of the rider. Another aspect of this helmet that improves comfort is its cooling characteristics. Good cooling properties are achieved through an optimized ventilation system. There are ventilation holes at the cheeks, under the peak, at the top and at the back. All these ventilation holes work together with the air ducts to ensure a fresh supply of air and let hot air escape. All technical features can be found on the Airoh Aviator page. If you have ever been to an MXGP race you may have the noticed the large Airoh service truck. This helmet lab has been set up to provide service to riders during races and to further develop the Airoh motocross helmets. It allows the technicians to go through the experience of riders directly at the track. It helps them analyze how the helmets have performed and can be improved. The results of this collaboration is a motocross helmet for champions. In the world motocross and enduro championships many riders use this brand, including: Antonio Cairoli, Glenn Coldenhoff, Jeffrey Herlings, Graham Jarvis and Marvin Musquin. Choosing the right size is easy with the size chart and a measuring tape. Get a soft measuring tape and measure the largest diameter around your head. Start about 2cm above your eyebrows. Keep the measuring tape above your ears around the back of your head at the biggest point. V1mx has a size chart available for every motocross helmet, which offers information about how to measure and what size you need. Is the helmet too small or too large? At V1mx you can return or exchange the product within a period of 30 days. Do you have a question about ordering or about the technical features of the helmets? Feel free to contact V1mx. Our team will gladly help you. You can easily reach us by leaving a message in the chat or by sending us an e-mail.